No Christmas morning is complete without an arrangement of Christmas stockings in your holiday home. 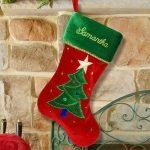 Make sure you are ready for the arrival of Ol’ Saint Nick this holiday season when you add custom Christmas stockings to your décor. Many years ago, a widowed merchant began facing financial struggles while trying to take care of his three daughters. In those days, women brought money or property (called dowries) to their husbands when they were wed. With no extra money and nothing of value to offer, the man became distraught, worried that his three lovely daughters would suffer a life of shame with no husbands in their futures. Saint Nicholas, who happened to be traveling through the merchant’s village, heard of the family’s predicament. He knew the man would not accept charity, but he wanted to help. He carefully slid down the man’s chimney and discovered the freshly laundered stockings the daughters had placed near the fire to dry. He quickly filled them with gold coins and vanished into the night. When the story of his visit spread, children everywhere began hanging their stockings by the fire in hopes of receiving gifts as well. These days, children aren’t the only ones who hang Christmas stockings out on Christmas Eve. 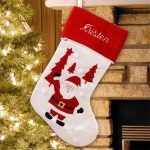 Many families display stockings as part of their holiday décor, regardless of their age. 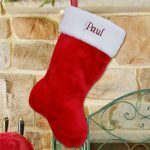 In some homes, Christmas stockings are put out for family members and close friends who are expected to attend holiday celebrations. In others, only the immediate members of the household receive stockings. Some families even hang stockings out for their pets! 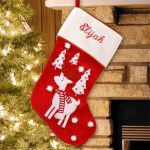 Christmas stockings add so much excitement and joy to holiday celebrations for the young, the young at heart, and even our furry friends. 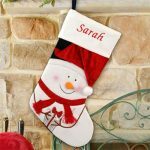 As the popularity of Christmas stockings has grown, so has the wonderful selection of styles, shapes and sizes. 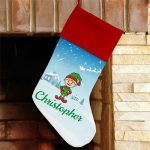 Whether you are interested in glamorous, plush or glittery stockings to add pizazz, you’re searching for old fashioned holiday décor to match your more traditional style, or you want a collection of personalized stockings for every member of your family, there are countless designs to choose from.